With the Hall of Monuments Calculator‘s release, there is a crush of people trying to get their numbers up to 30. Physical rewards end at 30 in the calculator. I thought a thorough rundown of the easiest way to do it would be in order. This is a guide to getting to 30 in the easiest, most stress-free way possible. I’d also advise people having their Calculator open, to move back and forth and follow along. Forget the preamble, lets just dive in. For Devotion, all you really need to do is acquire Miniatures, aka mini-pets. For the purposes of this guide, we’ll assume you have none. Lets get a rare mini-pet, a unique mini-pet, and another 18 to get us to 20. That should award us 5 points to our calculator. If you’re flush with platinum this will probably be pretty easy. Although I wouldn’t suggest anyone go purchasing mini’s right now, the prices have gone way up, especially for the rare types which have gone up to 100k in some cases. You’ll have a hard time finding a normal undedicated mini for less than 10k. Still all you really need to do is buy your way to the top. It goes without saying to perhaps wait a few weeks to see if prices fall again. For those of us having been playing for longer periods of time, with many characters to choose from we’ll almost certainly have somewhere between 25 and 35 mini’s. I have 9 characters total, 3 of which have already hit the 5 year mark. I won’t need to buy any to get to 40. If you’re thinking of getting a mini from the War In Kryta campaign or from a dungeon chest, or perhaps even Nicholas The Traveler, to that I’d say don’t hold your breath. Your best bet for mini’s in the long term without spending platinum, is to fill your available character slots (or buy some) and wait. The unique mini, (green rarity) you’ll most likely want to buy is the Bone Dragon. It was the first and by virtue of age the most common. Don’t forget to make sure it hasn’t been dedicated. Also, prices are high right now, waiting just a little won’t hurt. If you don’t want to buy your unique mini, the best way to do it would be by obtaining the Black Moa Chick unique mini. You can get it through a sort of easter egg scavenger hunt, an unofficial quest you get by participating in the Norn Fighting Tournament. Once you defeat Zho in that tournament she’ll hand over her Journal which starts off the whole thing. Read through the Black Moa Chick link for more details. You’ll need all 3 campaigns to complete this. If you still need a rare miniature (gold or purple) my suggestion would be waiting for the Canthan New Year festival this February. If you participate in the event fully, you’re virtually guaranteed a gold miniature. They are acquired through opening Lunar Fortunes, which have a .33% chance of dropping the rare celestial mini’s. If you get enough Lunar Fortunes, success is likely. Admittedly the last time I participated I had to participate with 2 characters before I received my Celestial Ox. There is some work involved. With any luck it won’t be a problem. Otherwise cash is your solution. The first thing I noticed when I typed my name into the calculator was that even though I have every single Hero in my Monument of Fellowship, it was still 6/8. I took a quick look and saw that I was missing a rare pet. Or rather, all 3 of them. The easiest one to get is the (non-miniature) Black Moa. If you’ve already done the Black Moa quest like any loyal Kurzick all you have to do is warp to the Aspenwood Gate outpost. The Black Moa always spawns in Ferndale after you’ve completed the quest. Put a party together. Kill maybe 3 or 4 groups between you and the Moa. Flag your heroes away from you so that they don’t kill the Moa as you’re trying to charm it. Then add it to your Hall. It took me all of 5 minutes. For those who haven’t done the quest, it’s called Beak of Darkness, and it takes you all over Kurzick territory. Altogether it’s not very hard either so I’d recommend this be done by anyone looking to score the rare pet point. Another easy rare pet to get to add to your number of statues is the Imperial Phoenix. Beat the final mission in Factions and one should be there very close to where you spawn afterwards. The problem is it is level 5. The Imperial Phoenix needs to be level 20 to be added. 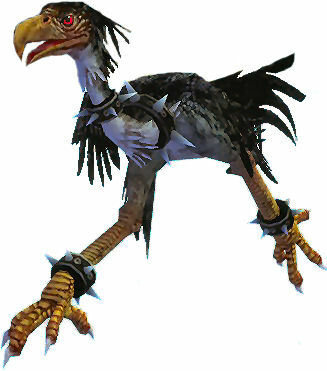 Probably the fastest way to do this is to go to the Zaishen Menagerie, add the phoenix to the menagerie, and ask the training captain to spawn some. Make sure you bring a mesmer hero with all their skills disabled except for a resurrection spell. Pump all their attributes into fast casting. Another helpful tip would be to bring a vampiric weapon to speed your demise, and don’t forget to remove most of your armour. Then attack one of the phoenix, once is enough, and let it kill you over and over. The fast resurrection should keep aggro on you, but just in case, flag your hero to the center of the pen. After an hour or two you should have a level 20 phoenix. That’s not the only way to do it, but it’s the cheapest. You can speak to the Zaishen Keeper to level the phoenix from 5 to 12 for 1k Balthazar Faction or 1 Zaishen Silver Coin. Each level after that will cost the same I believe. If you wish to continue with rare pets, the Underworld’s Black Widow spider is the only one left. Getting a guild group or paying a runner (as of yesterday it cost as much as 30 platinum for a run, but I expect cheaper runs in the future) to obtain the spider aren’t necessarily easy any more but they aren’t the only options. You can also unlock the spider from the Zaishen Keeper. It’ll set you back 50k Balthazar faction or 5 Gold Zaishen Coins. That’s 50 Silver or 2500 Bronze. Let’s move on to Heroes. Hero Armours are technically elite prestige armour. To get as many Hero Armour as possible (necessary to add your heroes to the HoM) you’ll probably end up buying a few. I should point out that Eye of the North heroes can only get their Hero Armour from Glint’s challenge or the Slaver’s Exile chest. 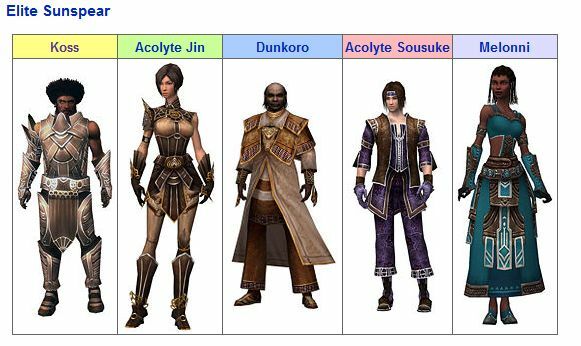 Elonian Heroes (including Olias and Zenmai) can only get theirs from Elonian Challenge missions or the Domain of Anguish elite dungeon. To add a Hero Armour to your Hero, simply talk to the appropriate NPC in the challenge mission outpost where you acquired it. Stolen Sunspear Armour are the cheapest I’ve noticed, anywhere from 5k to just under 10k. They’re also some of the easiest get yourself if you know what you’re doing. After completing the Consulate Docks mission, you need only speak to an NPC in Kamadan, Dockmaster Alharo, to travel to the challenge mission Dajkah Inlet. Guild Lords are the only enemies that drop SSA (directly into your pack) so if one were so inclined, they might try to target them first and run away from the other mobs to the next Guild Lord. Ancient Armour Remnants are typically more expensive due to the difficulty of the solo mission required. Mysterious Armour are some of the easiest I found, to acquire without buying. The Shadow Nexus doesn’t require a lot of running around and there is no real time problem. Portal Mages are your target and with the right build, including a Minion Master, it can be quite easy. The most expensive type, Deldrimor, can be seen at times for 20k to 25k. I would advise avoiding Deldrimor all together and going for Cloth of the Brotherhood, both by participating a few times in Glint’s Challenge and by purchasing them for 10k to 15k. The thing about Glint’s Challenge is, there is a guaranteed Cloth of the Brotherhood from the chest at the end. If you’re willing to beat it 10 times, then I wouldn’t necessarily advise buying any Cloth from other players at all. If I had to give advice on getting armours with as little hassle as possible I’d advise to run the challenge missions 4-6 times maximum, then purchase the rest. Drop rates are pretty terrible after you get your first few. Otherwise you’re going to want to bring an experienced group to these challenge missions. Trying the missions without reading the wiki walkthroughs would be pretty tragic. The MOX quest actually rewards a fair amount of cash. There is one hero that does not require a Hero armour to be added to the HoM. M.O.X. He can be added to the HoM as soon as he is unlocked. To do that you just need all 3 campaigns and I believe he’ll be waiting outside each of the major cities, in which case you’ll just need to talk to him. For the purposes of this guide, lets get M.O.X., the Imperial phoenix, the Black Moa (either of which I hope counts for “any pet statue”) and either farm for or purchase another 7 statues of your choosing. With luck you can get 5 SS Armours for 25k, just remember you only need 5 of that type. Again, for the purposes of this guide, lets just shoot for around 10 statues in the Honor Monument. We could easily go with 5, as 10 only adds one more point, but, I’d like to point out a variety of easy titles to go for. If you don’t want that extra point and want to get it in one of the other monuments, just keep in mind you only need 5. I will also point out that the other monuments by and large need materials and cash, and the best way to get those is by playing the game. As long as your playing, why not grab that extra 5 titles right? Very quickly as long as you’ve linked 3 characters to the HoM, you’ll get 3 points. With the addition of only 1 statue, you get 2 more points. 1 PvP statue adds another 3, and 5 statues another 3 points after that. 10 statues total will bring us 1 more point for a total of 12 points. Add the 5 points from Devotion and 6 from Fellowship, and already we’re at 23 points of our targeted 30. The following is a list of the ten statues I’d recommend getting. Hero of Cantha/Tyria/Elona: These only require the simple completion of each campaign, with no bonus required. Each awards 1 statue. Protector of Cantha/Tyria/Elona: As long as your going through those missions anyway, why not pick up those bonuses? It’s only a little extra work for the most part. Guardian titles: They’re easier than you might think. Sure they’re in Hard Mode, but a good guild and good friends can get you through these easily. You might be a little out of luck otherwise. I’ll also note that if you do all 3 Protector titles and all 3 Guardian titles, you’ll receive the title Legendary Guardian, a bonus statue for completing the previous 6. Zaishen Supporter: This is your PvP title if you don’t want to PvP. All you need to do is acquire around 200 Zaishen keys, through 5k balthazar faction or 1 Zaishen Gold Coin (10 Silver, 500 Bronze) and each time you open the Zaishen Chest on the Isle of the Nameless, 5 points will be added to the track. You’ll need 1k points to gain rank 3, which can then be added to the HoM. There’s even an easy way to get started. I’m not going to explain the history of the Xunlai Tournament House, except to say it was shut down, and now every single player gets 50 free Tournament Reward Points. Just register with Tolkano in Great Temple of Balthazar, wander over to High Priest Zhang, then go trade those points in for 10 free Zaishen Keys with Tolkano. Unlucky: As much as I hate the 9 rings of death, it requires around 29 hours of standing in the rings to get to the 2nd rank of this title. So why do I recommend it? It’s one of the few titles you can straight up buy from a vendor. You’ll get it long before the Lucky side of the title too. Just get yourself to a boardwalk weekend or any Canthan festival, buy up some tickets, a lot, and park yourself overnight. Saviour of the Luxons/Kurzicks: You only need rank 4 in each of these to add the statues to the HoM. Alliance Battles and Speed Clear Vanquish groups are the fastest ways to gain 550k faction, and believe me, in an organized Faction guild it won’t take you long to reach rank 4. These are probably 2 of the easiest statues to get in the game. Eternal Spearmarshal and Eternal Lightbringer: There is a farm for these points in the explorable areas outside the challenge mission Remains of Sahlahja. Usually one hangs onto two quests, which furthers these farms by adding more opponents. Please refer to this link and the notes under “The Desolation” for more details. If any of the above is unsatisfactory to you, here are some further alternatives. – Vanquishing takes a long, long, long time. Admittedly there are side benefits. Like gaining kurzick/luxon faction by talking to the priest at the resurrection shrine before you start. A little bribe goes a long way. Or how about EotN reputation in those areas, which also adds to your Master of the North title, if you intend to go for that. It’ll also rack up a heap of cash, materials, Lightbringer points, Sunspear points, points towards Lucky if you’re using Lockpicks, points towards Treasure Hunter or Wisdom if you’re going for those titles. It’ll fund your armour, weapon, and sweets titles but it will take a long, long, long time. It’s my number one suggestion for people with too little money, no interest in PvP, and plenty of time on their hands. – You could buy your way to the top by completing the Sweet Tooth, Party Animal, Ale Hound, or Lucky (I’d go with 9 rings, not Lockpicks) titles. – The Skill Hunter titles aren’t as difficult as they might seem as long as you have a fine grasp of the wiki and the easiest way to get to foes you need to cap. Not to mention the 1k platinum per Capture Signet you’ll need to buy 290 elite skills. There is another way to acquire elite skills, if you have them unlocked. Elite Skill tomes can be bought for varying prices, sometimes very little, sometimes quite a bit. The rarer types can cost as much as 20k if you’re unlucky. 10k is a much more reasonable sum, and even less for the common or unwanted tomes. They can also be bought for 2 Gold Zaishen Coins. In portions one skill hunter title may be more appealing than others. The Tyrian Skill Hunter title only requires 90 elite skills, for instance. 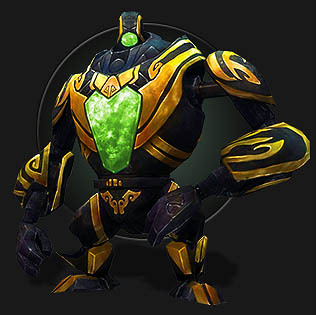 Many elite skill hunters fail to remember that some elites can be found in the Eye of the North expansion, prodigious use of the wiki is advised. – Conqueror of Sorrow’s Furnace is probably the easiest, if lengthy, high end content statue to get. You could do this with Hench & Heroes if necessary. In fact if you’ve already done the opening Sorrow’s furnace quests and have Final Assault unlocked, all you need to do is complete FA, which isn’t lengthy at all. – Master of the North. Overall it involves too many different activities, exploration, dungeon completion, vanquishing, Hard Mode dungeons. It’s pretty hard to keep track of everything and a lot of work. – The PvP titles are such a grind, I’m not sure what rank you need to be to add them, but its probably not as bad as I think. – Treasure Hunter and Wisdom Titles. Lockpicks cost a heap, and these 2 titles are some of the worst grind in the game. – Cartography titles. Don’t get me wrong, if you get the Texmod addon and you’re already Vanquishing anyway, it’s not that bad, but I’d avoid it unless necessary. Since we only need another 7 points we don’t have to get every set of prestige armour ever. I also don’t know which professions you’re doing this on and what kind of materials you have at hand, so honestly these decisions are up to you. However for the purposes of this guide lets get the Kurzick/Luxon prestige set of armour. It’s still reasonably priced even after the huge price jumps with the release of the calculator. Now obviously if you’re doing this all on one character, bag space is an issue. I would advise doing it on various characters if possible. If not you’ll have to resign yourself to salvaging the armour after you’ve added it to your Hall. We’ll also get 4 more armours of your choice for a total of 5, which gives 2 points, and 5 total points for the monument. That puts us at 28. With only 2 points left, all we really need are 2 weapons to put in our display. The easiest and cheapest are the Opressor and Destroyer weapons. Obviously prices have gone quite far up for Destroyer materials, but a quick solo farm of Hulking Elementals outside Ascalon City in Hard Mode could get you some free granite. Diamonds and Onyx may be a little harder to come by. Note: Each Destroyer weapon has the same cost. 5k cash, 250 granite, 100 iron, 10 diamonds and 10 onyx. You should have nearly enough Medal of Honor’s to trade for an Opressor weapon after one clean run through of the War In Kryta storyline, plus a reasonable number of bounty quests turn ins. Now which weapons you go with, or maybe you already had some Tormented Gemstones and want one of those, that’s up to you. I don’t know what profession you are, which weapon would be useful to you or what you like aesthetically so that will require research on your part. Keep in mind though, for the purposes of this guide, 1 destroyer weapon and 1 opressor weapon is my recommendation. If you have plenty of materials, access to Medals of Honor, or gemstones, this is likely an ideal place to make up for other statues or titles that you didn’t get finished. Obviously if you find it easier to add more armours than mini-pets, or more weapons than Hero statues, then by all means do so. This is not a strict guide, just a rough draft of whatever is easiest for you. If you don’t have enough money or materials I’d probably work on Vanquishing to pay your bills and move up complimentary title ranks. Honestly if you find yourself thinking “I can’t pay for that”, vanquishing is something you should really consider. And please, please, do not forget to speak to the priest at the shrine to gain luxon and kurzick faction. Many people do not realize this option exists. By the time you finish vanquishing all 3 continents (minus the eye of the north areas which, for the sake of ease and time, I advise against, you should have 4 titles, have contributed to various faction titles, and (unless you spent your gold on lockpicks) be fairly rich in platinum and materials. Doing the Zaishen quests as often as possible will certainly help out a number of the other titles you may be going for. Not only will the mass of people make it easy to find a group, the side benefits are hard to ignore. Zaishen Coins, gold, reputation, faction, not to mention the bonus from the Z missions, or the balthazar faction from the PvP quest are all insanely beneficial to your efforts overall. The Zaishen Supporter statue is probably a bit harder than I suggested, but for many it’s the only PvP statue they’d even consider getting. It’s also worth 3 points. There are a lot of different ways to do this and I’m only advising the ways I found easiest. Adding a couple extra points in one monument to set off the monuments you don’t want to do in another is a given. Hopefully I left enough leeway that people can find their way around to getting 30 in their HoM calculator. 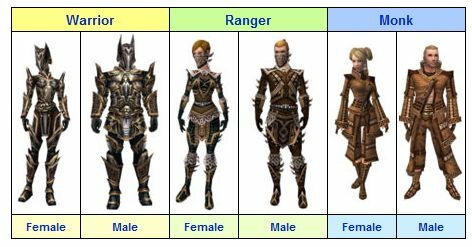 Finally I’d just like to thank the contributors to the Guild Wars Wiki, you guys don’t get enough credit.